A big thank you to all of you who came to the Devonshire Day fundraiser for the Immrama Festival on March 14th, 2010. Once again the weather was great although on the cool side, this was the 7th Devonshire Day and we yet have to get a really bad day weatherwise. St. Carthage is indeed looking after us well. The cold winter leading up to the 14th of March resulted in very few flowers in the gardens, however the history alone of the castle and the garden is facinating and once again Chris Tull, Head gardener, had a very busy day as a guide. 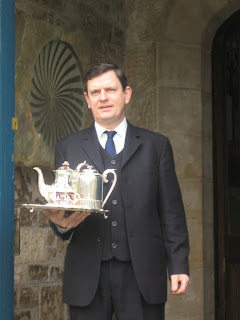 The tea and cream was served in the Pugin room by the Duke's butlers, Michael, Leonard, Patrick, Simon and David who did a tremendous job of having everything ready on time for every group. They were ably assisted in the kitchen by Theresa and Esther. Immrama committee members tried to guide all to the relevant parking spaces (difficult as parking spaces run out),ticket gate and Pugin room, while the Immrama Chairman, Bernard Leddy and Immrama President, Peter Dowd provided some historical information on the area and the 6th Duke during the tea and cream. Catherine provided a silent presence with her medic kit, just in case. She was not called upon. The staff of the Heritage Centre were very helpful in the days leading up to the Devonshire Day assisting with the booking of tickets and were kept very busy on the day with the showing of the awardwinning audio-visual presentation on the History of Lismore, while Mealla made sure all who went through the gates had a ticket. Thank you all very much. We had just over 300 visitors on the day and unfortunately, as in other years, we had to disapoint many people in the afternoon as the 3.00 pm and 4.10 pm tours had totally sold out. Why not treat your Mother to afternoon tea at Lismore Castle on Mother’s Day Sunday 14th March 2010. Part of the visit also includes a tour of the castle’s Spring Gardens. Afternoon tea will be served in the Pugin Room by the Duke of Devonshire’s Butler, (an opportunity not normally available to visitors). Following tea guests will have the unique occasion to pre-view of Lismore Castle Spring Gardens. The tour of the gardens will be given by Mr. Chris Tull, Head Gardener. The Lower Garden was formerly known as the Pleasure Grounds and is spectacular in the Spring Time. A number of camellia, rhododendrons and some particularly magnificent magnolias can be found here. There has been extensive planting over the last number of years and the gardens are being constantly refined and improved. The walls surrounding the garden date from the early 18th century and have been planted with roses such as Francis E, Lester, Bobbie James, Rambling Rector to name but a few. The Lower Garden also boasts some spectacular sculptures by well-known artists Eilis O’Connell, Anthony Gormley and Marzia Colonna. The Upper Garden is one of the few Jacobean gardens to survive in anything like its original form. The first Earl of Cork helped by his gardener John built a high surrounding wall and a raised terrace terminated at either end by turrets. The Central Walk, which is between the herbaceous borders, is backed by yew hedges and was laid in dramatic alignment on the Pain spire of the Anglican Cathedral. The hedges provide a suitable background for the herbaceous borders as one walks towards the top terrace. Located here are some artistic works by Bridget McCrum, Simon Thomas, Emily Young and Edwin Whitney Smith. A complimentary visit to the recently refurbished exhibition galleries at Lismore Heritage Centre and an opportunity to see the Award-winning Film ‘The Lismore Experience’ is included in the price. The Immrama Travel Writing Festival Committee is hosting this event and proceeds will help fund the 2010 festival programme. Tickets are available from Lismore Heritage Centre and cost €20.00. For further enquiries contact on (058) 53365 or (058) 54975.